Bowhunter Magazine has once again joined with Nelson Outfitters (Dave Nelson, 307-751-2262, nelsonoutfitters.com) and a topnotch group of bowhunting equipment manufacturers to sponsor our 2018 Youth Hunter Essay Contest (see the list of sponsoring manufacturers on page 112 of the November/December issue of Bowhunter Magazine). This is our 22nd annual essay contest, and we hope youth participants will make it another memorable one! Last year's Grand Prize Winner, Alex Young (right), enjoyed hunting turkeys with his adult sponsor Nate Corley (left) and Assistant Editor Brian Fortenbaugh (center). Last year's 1st Grand Prize Winner, Alex Young, and his adult sponsor, Nate Corley, from Puyallup, Washington, spent three days chasing longbeards in Wyoming, and Alex killed a beautiful turkey with his bow on the last day of the hunt. Congratulations to Alex, as well as to the rest of the prizewinners from last year's contest who we're confident are putting their new gear courtesy of our generous friends in the archery industry to good use. If you're in the market for new hunting equipment, we urge you to show support for these companies and buy their products. They understand just how important youth hunters are to our sport. "Give three examples of how bowhunting can bring family and friends closer together?" Entrants must be between the ages of 12-17 as of March 1, 2018. Each entry must be accompanied by a cover letter telling us about your bow-and-arrow experience and interest in bowhunting. You'll also need an adult sponsor who will include a letter formally nominating you for the contest. The sponsor must also be willing to accompany you on the trip. Travel expenses for both of you will be covered. 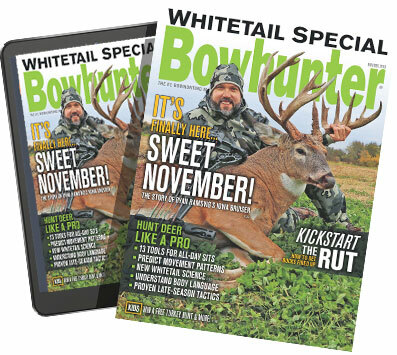 For the official contest rules, please see page 113 of the November/December 2017 issue of Bowhunter Magazine.